Welcome to the Three Peaks website. Careful planning should enable you to climb in daylight, drive by night, and avoid most of the congested areas at peak traffic times. Remember that your team will need a driver or two that won't be climbing the mountains, and you will need a competent navigator to avoid getting lost on the peaks in poor weather. Please make sure you carry all of the kit and equipment as detailed on this website so that if the weather turns - you're fully prepared..! Join our Facebook Group! Remember - stay safe, and if in doubt, turn around and head back down. Enter an organised Three Peaks Challenge here..! 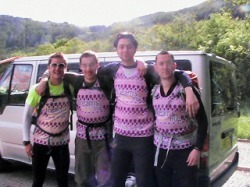 Organised Three Peaks or Your Own Challenge in 2012? This website is intended to give you all of the help and advice to organise your own challenge. However, if you wish to take part in an organised event - without the requirement to raise thousands of pounds for a charity you have no real interest in - or you would like to attend some useful training and preparation days in the Lake District, Snowdonia or Scotland - then click here: Three Peaks Challenge 2011. Do you fancy trying to Peak Three Times in Twenty-four Hours? That is, to climb, and travel between, the highest three peaks in England, Scotland and Wales. Scafell Pike in England, Ben Nevis in Scotland, and Snowdon in Wales. A total drive of some 460 miles, total walk of 24 miles, and a verticle climb of 10,000 feet. Remember that these are some of the highest mountains in the UK, and you should be fully prepared for serious mountain conditions which may involve steep, rough and rocky paths, temperatures of -40 degrees (with windchill) even in summer, high winds and stormy weather, white-out or seriously reduced visibility, remote locations many miles away from medical help, lack of communications via mobile phone or VHF radio. You need to ensure that you have good mountain fitness, have a competent navigator, and are carrying enough comfort and safety equipment to safely venture into these mountains. If in doubt, postpone your challenge until you are confident your event will be safely organised. Firstly, you need to know exactly what is involved. You will need a team of walkers, a couple of drivers, a suitable vehicle, some accommodation, some equipment, and plenty of enthusiasm. A successful challenge requires good planning, good training and knowledge, and a fair amount of luck during the challenge itself. Friday: Collect vehicle, drive to Fort William, overnight stay. Climb Snowdon (4 hours) - finish challenge - drive home. Easy peasy. Or perhaps not so easy. You will encounter some serious driver fatigue, roadworks, motorway accidents, peak hour traffic delays, inclement weather, darkness and thick mist, lack of sleep, lack of food, minor injuries and incidents, navigational errors, etc., etc,. Good luck... ;-) For help with transport contact Merseyventure - richie@merseyventure.com - who can provide minibuses, drivers, and mountain guides. Before arriving in Fort William you will need to do some mountain training, some navigation practice, know the route - both for driving and for walking - have your equipment and food sorted, as well as reliable transport and drivers. Be prepared for all kinds of weather, even in the summer, and don't forget your anti-midge spray. Use the links above for advice regarding equipment, transport, accommodation, organised events - and also take a look at the forum which has plenty of up-to-date information from other Three Peakers..! Anyone who has a reasonable level of fitness, and some good stamina and determination, should be physically capable of completing this 24 hour challenge. However, there is a lot more to the challenge than just being 'able' to complete the distance..! It is hugely important that in the months before your event, you get out into the hills and achieve some 'mountain fitness' during your training. This is when your legs and body get used to the effort of climbing steep hills, walking on uneven or muddy ground, and get used to the braking effort required on long descents. It's also a great opportunity to get used to walking poles, rucksacks, maps and compasses..! Try out all of your new kit before starting your challenge. This is especially true for new boots. Check out our 'Three Peaks Training' page. 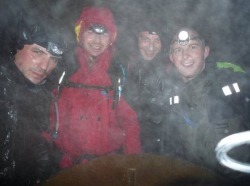 Many people ask about an official Three Peaks record, or suggest they know of a team that claim the record. 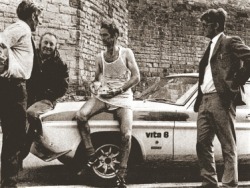 However, the fastest recorded and verified time I am aware of was set by Joss Naylor MBE and Frank Davies in a Ford Capri back in 1971 when speed limits on unrestricted roads were a bit more relaxed than today..! The pair started by dipping a toe in the loch at Fort William, and finished at the sea in Caernarfon, taking a total time of 11 hours and 54 minutes. The Yorkshire Three Peaks record time is 2 hours 30 minutes. Click here for some record history and images. Apart from the challenge information contained within this website, the 3 Peaks Forum as detailed above, and the numerous links found in the links page, we recommend that you also visit the Three Peaks Challenge website LINKED HERE. You may consider attempting the 24 mile Yorkshire Three Peaks first to test your fitness. 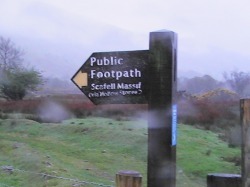 The image on the left is the fingerpost pointing the way to the Hollow Stones area on Scafell Pike. For some other useful information and advice to help you safely climb each of the three peaks, and drive between them, check out our LINKS page for the Three Peaks Challenge, in the navigation tab at the top of this page. Some groups may wish to take part in a larger, organised event, either with the aim of raising money for the charity concerned, or just wanting to know other groups are participating at the same time so they can enjoy the camradery with the knowledge a safety net is in place. Unfortunately many charity events will require a fundraising commitment of some £5000 or more, which can be very restrictive for some groups - especially if they would prefer to voluntarily raise funds for a charity or good cause which is more meaningful to them. The Open Challenge Series 2012 has a number of organised Training Events, Yorkshire Three Peaks and National Three Peaks Challenge events open to all teams. Just one small, simple entrance fee, then no fundraising at all. Teams are free to use these events to raise money for their own favourite charity, and previously single teams have raised over £100,000...! Other teams choose not to attempt any fundraising at all. If you are considering entering a team into a private or charity fundraising Three Peaks in 2012, then click the links above for all of the information and advice you could want. For more details, please click the link or image above. Check our Three Peaks videos on YouTube. Are you tough enough to take the challange? The UK's highest mountains. Ben Nevis in Scotland, Scarfell Pike in England, Snowdon in Wales. 3 Peaks in 24 hours. Big mountains, three peak challange. Check your kit, choose your charity, and away you go. Get fit, get training, stay safe. 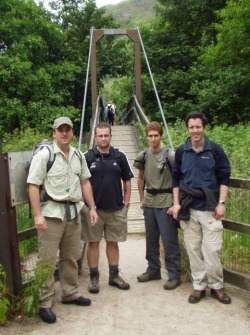 Merseyventure organise a variety of adventure challenges throughout the year, and these include the national Three Peaks Challenge, Yorkshire Three Peaks, West Highland Way, Open Challenges and Charity Challenges, as well as Team Adventure Challenges.Trying to complete your challenge in under 24 hours? We can help with training, mountain guides, logistics, drivers, minibuses, guides. Peak Three Times In Twenty-Four Hours..!